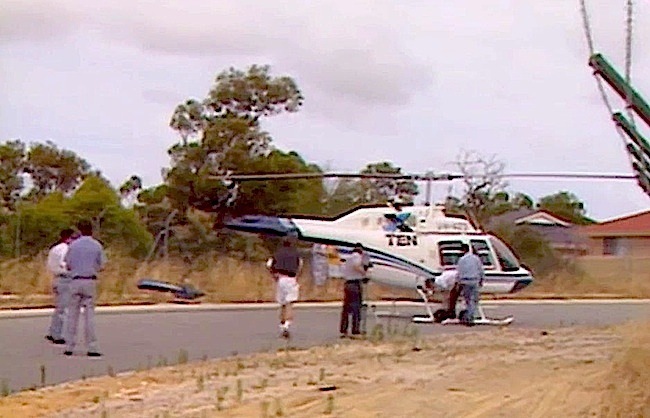 On Saturday 19th January 2013, the Channel TEN Perth News helicopter was filming a truck rollover on Weir Road at Baskerville, in Perth’s Swan Valley, when it was forced to make an emergency landing. 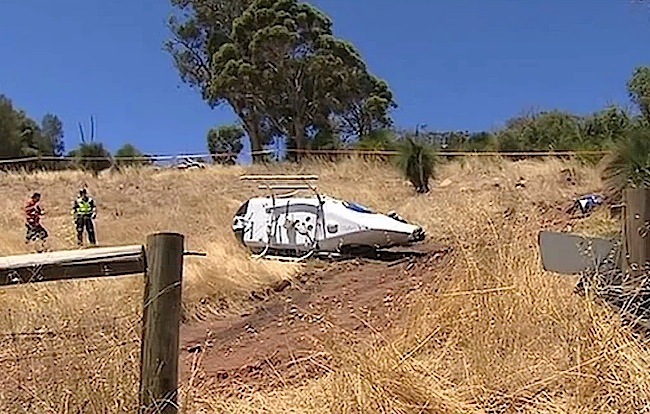 The TEN News cameraman and pilot escaped uninjured after the helicopter made a crash landing on a lightly timbered rural property, that was surrounded by dry grass and undulating terrain. The chopper came to a rest on its side, having lost its tail rotor in the accident. 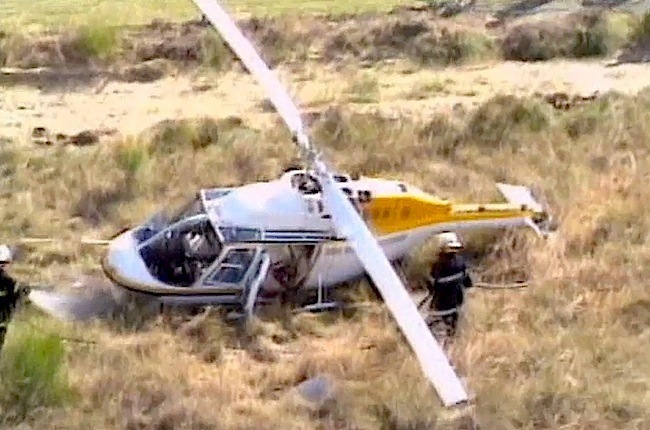 The dazed cameraman Adam Delmage jumped out the wreckage, followed a few minutes later by the pilot Paul Debenham, who has 40 years of helicopter experience and works for the aircraft company Heliwest. It was heartening to see the empathy shown by fellow News cameramen Luke Williams of Channel Seven and Jon Kerr of Channel Nine. The event was captured by the cameras of all major metropolitan stations: 7,2,9 and 10. Adam Delmage caught the crippled aircraft’s descent as it spiralled to the earth and Jon Kerr captured a clear shot of it hitting the ground. Seven also captured the event, though their vision of the crash was partly obscured by a fire truck. The Seven reporter went on to say that TEN had two previous helicopter incidents, prior to this one, in which no one was injured. Though this was the first such emergency for the current TEN helicopter company in 21 years, since it was formed in 1992. “Just for the record, Channel Ten had two previous helicopter incidents (or three if you count two in one day at the station helipad). The first one involved an ex-air force pilot who had been working with the UN peacekeeping force in various overseas locations. He simply ran out of fuel about 100 feet off the ground after ignoring pointed interjections from cameraman Jamie McNabb that the fuel warning light started to flash over Yanchep. The chopper flopped onto the station helipad and Jamie escaped with back injuries. He opted to retire from taking pictures soon after his near miss. Tim Boase sent around a dolly from Channel 7 to remove the chopper from the street. Like Jamie McNabb, Anthony Hasluck decided helicopter flying wasn’t for him and he left the news game shortly after. The Channel Ten incidents obviously caused some concern to local residents and NEW10 joined with TVW7 to save the television zone helipads from forced closure. Kevin Campbell, Tim Boase and I joined forces to assure the Stirling City Council that the helipads were safe. Channel Ten agreed to limit chopper operations to between 7am and last light because we were the closest station to new housing estates while 7 and 9 operated some distance away. If memory serves me correctly, the stations all agreed as part of our plan to maintain the virgin bush (and its kangaroos) between 7 and 10 in perpetuity as a “gift” to the nation (I recall the land was owned by Channel 7 while Channel 9 was keen to sell its land for real estate development). These much appreciated anecdotes soon brought back sad memories of other aircraft incidents that impacted on the lives of television staff. We have devoted a tribute story to each of these valued staff members who lost their lives in this unfortunate manner.